Waialea Bay is located in the southern portion of Kawaihae Bay, on the western coast of Hawai‘i. Take Hwy 19 north about 23 miles from Kailua-Kona (or south from Kawaihae about 5 miles), and turn onto Puakō Beach Drive. Then take the first right onto Old Puakō Road, and watch the numbers on the telephone poles. Turn left between poles 69 and 70. The road is rough, but driveable. Parking is available near the beach. The MLCD extends from the highwater mark seaward to a line from the point immediately north of ‘Ōhai Point to Kānekanaka Point. 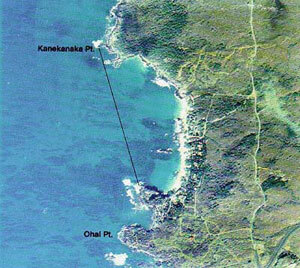 Although access to Waialea Bay is not particularly easy, the site is popular with many Big Island residents. The beach (known locally as Beach 69 because of the pole marker) erodes due to strong surf during winter months, but is pristine during the summer. The bay’s bottom drops off gradually from the beach to depths of about 30 feet outside the bay’s mouth. An intermittent stream enters the bay, and surface visibility is reduced during periods of freshwater intrusion. The best reef is in the MLCD’s southern portion, and extends out beyond the District’s boundaries. Depths range from about 10 to 30 feet. Coral communities are also found around the rocky prominence inside the bay. The diversity of marine life in Waialea is among the best in all of Kawaihae Bay, which makes it a popular site for snorkel and SCUBA activities. Humpback whales are often seen outside the bay during winter. Waialea is a somewhat sheltered bay, but high surf occurs during winter months. No lifeguards are on duty at the beach. To have or possess any fishing pole and hook-and-line, and to fish for, take or possess any finfish using such gear. To possess in the water any knife and any shark billy, bang stick, powerhead or carbon dioxide injector. With a permit to possess and use legal nets to fish for, take or possess finfishes over the sandy bottom areas within the District, and to engage in activities otherwise prohibited by law for scientific, propagation or other purposes. To fish for, take or injure any marine life (including eggs), or possess in the water any device that may be used for the taking of marine life, except as indicated in permitted activities above. To take or alter any sand, coral or other geological feature or specimen, or possess in the water any device that may be used for the taking or altering of a geological feature or specimen. To engage or attempt to engage in fish feeding.